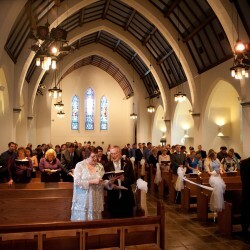 St. Luke’s has a beautiful sanctuary that many find an attractive place to hold their wedding. Weddings should be scheduled at least three months in advance. The process begins with a telephone call to the church office (562) 436-4047. Holy Baptism is a sacrament that expresses God’s unconditional love for us, our incorporation into the Body of Christ, our reception of the gift of the Holy Spirit, and our commitment to be nurtured in our faith. In the Episcopal Church, the service of Holy Baptism takes place four times a year: the first Sunday after Epiphany (January), the Easter Vigil (the night before Easter), the Day of Pentecost in the Summer, and All Saint’s Day (the first Sunday in November). Adults interested in baptism, and parents who wish to have their children baptized, should attend church for at least two months prior to the service of Holy Baptism and take part in baptism preparation. Please contact the church office at (562) 436-4047 for more information.